Affordable housing remains one of the main barriers to economic stability for many families. Housing costs continue to increase in the United States, yet family income has not kept pace. One-third of U.S. children live in households with a high housing cost burden, defined as spending more than 30 percent of the household’s monthly income on housing. Housing instability, which includes situations such as being behind on rent and making multiple moves, is associated with an increased risk of poor child health, including hospitalizations and of maternal depression. Sustained housing instability can lead to homelessness, which can further destabilize families, causing trauma with severe negative implications for children’s healthy development and hurt their opportunities for educational achievement and attainment. Access to housing assistance remains extremely limited—only one in four families who are eligible for rent assistance in the United States receive it. Yet earlier this week, U.S. Department of Housing and Urban Development (HUD) Secretary Ben Carson announced a proposal that would further limit access to housing assistance for families. While elderly and individuals with disabilities are exempted from the work requirements and rent increases (for a six-year period), there is no similar exemption for families with children. In most low-income households with children, there is at least one family member who is working. Yet due to low wages and skyrocketing rents, parents still struggle to make ends meet. 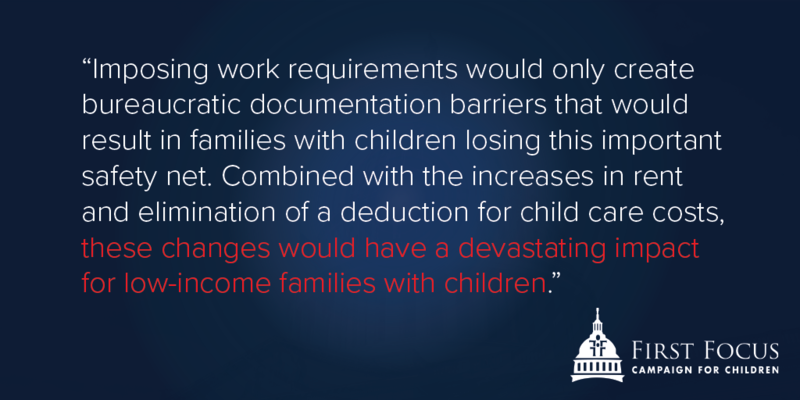 Imposing work requirements would only create bureaucratic documentation barriers that would result in families with children losing this important assistance. Combined with the increases in rent and elimination of a deduction for child care costs, these changes would have a devastating impact for low-income families with children. The Center on Budget and Policy Priorities estimates that increasing the minimum rent for households would put a million children at risk of homelessness. Child and youth homelessness is already skyrocketing, with 1.3 million students identified as homeless by the U.S. Department of Education. In addition, HUD officials have claimed that due to budgetary constraints, they will be prioritizing housing for seniors and people with disabilities, as well as removing lead-based paint from housing. First Focus urges that, along with seniors and people with disabilities, we must prioritize families with children. The U.S. has the ability to assist all of these populations simultaneously, and it is crucial that children have stable housing while undergoing critical stages of development. In order to actually help families achieve economic security, we should make investments in affordable housing, childcare, transportation, higher education, and job training. When it comes to increasing access to stable housing, we need to increase rental assistance, expand access to civil legal services for families facing evictions and other housing disputes, and build upon programs that pair housing with wraparound services. This includes increasing and building upon partnerships between public housing authorities and public school systems designed to improve the educational outcomes of children living in subsidized housing.